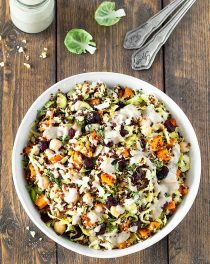 This hearty chopped Brussels sprout quinoa salad features tender roasted sweet potato, buttery chickpeas, sweet cranberries, crunchy walnuts and a delicious walnut dressing. 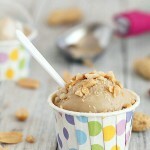 It’s the perfect combination of flavors, textures and healthy ingredients. You can easily customize it with what you have on hand. Replace the quinoa with brown rice, cranberries with pomegranate, walnuts with pecans, sweet potato with butternut squash or pumpkin. I guarantee that your salad will be delicious with any of these options. Use a food processor with the blade attachment to thinly slice the Brussels sprouts. If you don’t have one, you can use a mandolin, a box grater, or a sharp chef’s knife. The walnut dressing is pretty easy to make and tastes amazing: simply put all the ingredients into a blender and pulse until smooth. This chopped Brussels sprout quinoa salad can be prepared ahead of time. Mix everything without the dressing and refrigerate it in a sealed container for a couple of days. Serve the salad as a main course for lunch or as a side dish. As it’s vegan and gluten-free, everyone at the table can enjoy it! 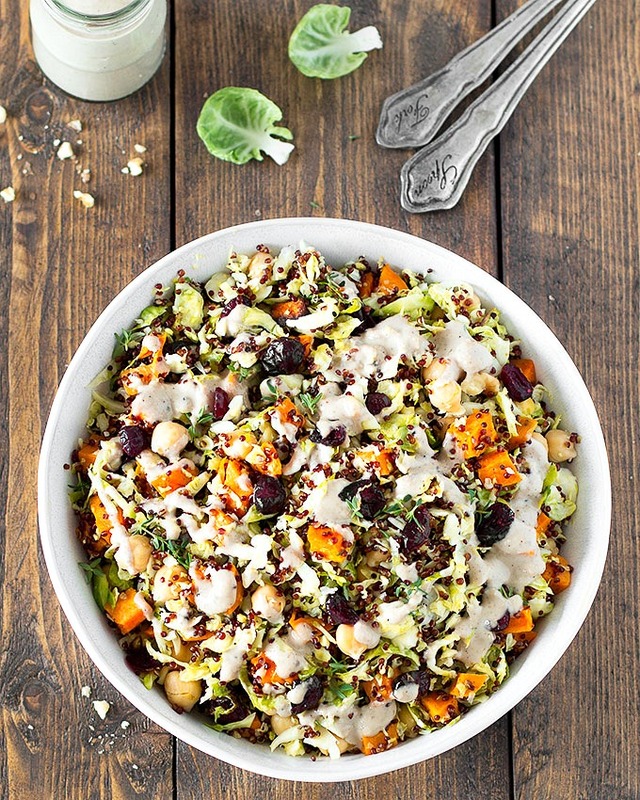 This chopped Brussels sprout quinoa salad with walnut dressing is the perfect combination of flavors, textures and healthy ingredients. Pre-heat the oven to 200 degrees C (392 degrees F). In a large bowl, toss the cubed sweet potato with 1 tablespoon of olive oil, salt and pepper. 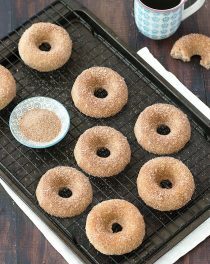 Spread it out in a single even layer on a baking sheet covered with parchment paper. Bake for 20 minutes, or until the potato is tender. Rinse the quinoa and drain. In a small saucepan, combine the quinoa with water and bring to a boil uncovered. When it starts to boil, reduce the heat to the lowest setting, cover and simmer for 20 minutes or until the water is absorbed and the quinoa is light and fluffy. Thinly slice the Brussels sprouts. You can use a food processor with the blade attachment, a box grater, a mandoline or a sharp knife. Prepare the walnut dressing: put all the ingredients in a food processor and pulse until smooth. In a large mixing bowl, add the quinoa, Brussels sprouts, chickpeas, cranberries and walnuts. Pour the dressing, toss, garnish with chopped thyme and serve. 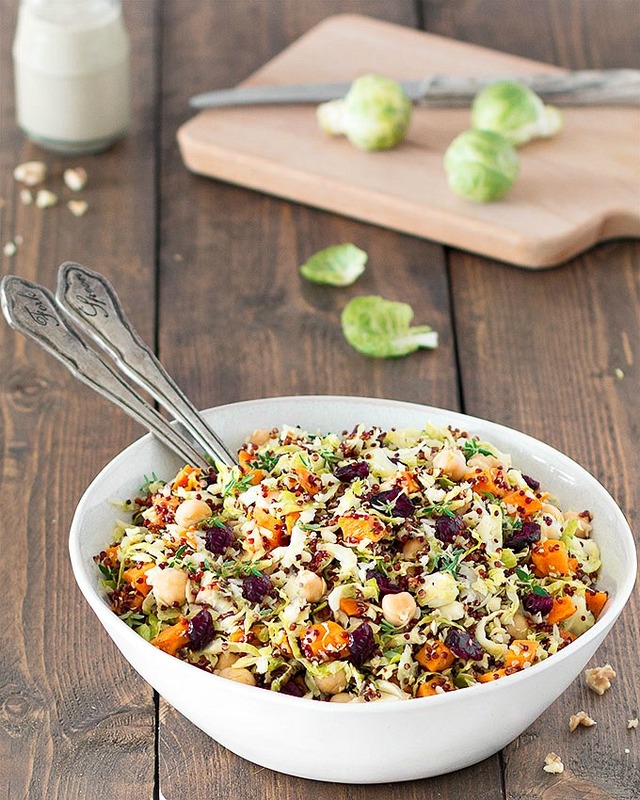 Enjoy this delicious chopped Brussels sprout quinoa salad! 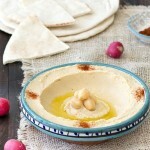 Do you roast the chickpeas, or just put them in straight out of the can? Are the Brussell Sprouts roasted or raw?